This midrise, relaxed fit pant sits below the waist and is straight through the hip and thigh with a bootcut leg, creating a lengthening effect. The zip fly, button closure, contoured waistband, side slit front pockets and rear welt pockets are all constructed to assure a great fit. Our machine-washable twill blend of 97% cotton and 3% spandex makes the "Bull" easy to wear, wash and wear again. 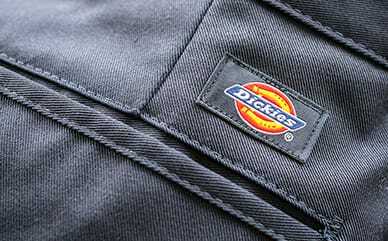 Our Dickies Girl collection focuses on the Junior girl. Every piece of Dickies Girl apparel stands for quality, toughness and pride that embodies the spirit of the American girl. With styles ranging from skinny to plus, we empower the junior girl to be herself while looking good!